Several weeks ago, Bethesda announced its newest project, Wolfenstein: The New Order, via abrupt email. The game is being developed by MachineGames, and is currently set to debut late 2013. As I’ve said before, I’m happy to see an old-school title reimagined for the current generation of gaming. However, I’ve also expressed my concern for the game’s future, as well as how it reflects on Bethesda’s behalf, seeing as how they’ll be publishing the game. Luckily, I have since had the opportunity to sit down with the project’s Senior Gameplay Designer, Andreas Öjerfors, who not only laid my few doubts to rest, but instilled a refreshing sense of anticipation regarding the game’s Q4 release. No matter how you approach the subject, the Wolfenstein franchise is antiquated, plain and simple. The only semi-recent release that the name has seen was the 2009 release of “Wolfenstein,” available on the PlayStation 3 and Xbox 360, which proved to be nothing more than a botched mishmash of generic FPS ingredients. With that being said, my initial pessimism surrounding The New Order was that the game would be unable to find a balance between the retro style that founded Wolfenstein and modern, streamlined FPS gameplay. Reinventing the game from scratch would add that balancing act to the already intensive task of creating a satisfying first-person shooter experience—a recipe which I expected to be the greatest difficulty for the developers. Apparently, MachineGames thought so, too. Öjerfors agreed that the project had appeared both daunting and promising from the beginning, and for many of the reasons I’ve outlined. He went on to explain that, from day one, it had been a key imperative to honor the history of Wolfenstein while avoiding the flaws that hinder it. This represents the duality of the challenge: being able to blow FPS fans away with an entirely new experience, but also striking the aforementioned balance between classic and innovative. Though I’d played the game’s initial live demo myself, I still felt uncertain on how exactly that would be done. Intrigued, I inquired about the design choices that had been made in order to achieve that balance. 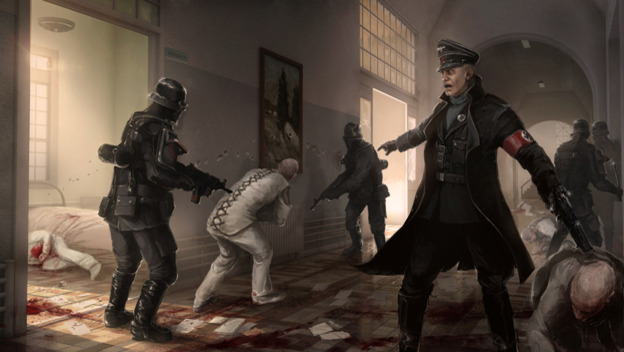 Arguably the most pivotal factor in The New Order’s development, Öjerfors explained, was not what you’d expect from a Wolfenstein game: It’s the story. The series has its roots in shooting sci-fi-inspired Nazis just for the sake of it, so the importance of storyline was the last thing I expected to hear. Öjerfors continued, saying that the ability to make the necessary changes to the game needed to appear necessary. Altering the formula should be more than simple gameplay and control choices; they wanted the improvements to feel natural and in-sync with the game’s setting. This leads us to the ingenuity behind the game’s story. As the game’s official announcement details: “The year is 1960, and the Nazis have won World War II. War hero B.J. Blazkowicz must launch an impossible counter-offensive against the monstrous Nazi regime that has conquered the globe.” At first glance, this sounds like nothing more than a prototypical vigilante plotline, in which the macho character is the only one who can bring a tyrannical system to its knees. This brief overview, however, does not do the game justice, as it glazes over the very premise upon which the game’s control innovations are built. First and foremost, Öjerfors said, is that they didn’t choose place the game in an alternate 1960 for the hell of it. The time gap between the game’s previous story entries created the opportunity for the developers to do exactly what they needed to do: make changes -- and plenty of them. Because the game is set in an entirely unknown era, one that is dominated by a different kind of Nazi regime and headed by new (and amusingly colorful) dictators, MachineGames now has access to whatever creative freedom they need. By eliminating the game’s ties to Wolfenstein canon and creating their own world, so to speak, they gained the ability to mold the infrastructure of the game as they saw fit without putting B.J. Blazkowicz out of context. Similarly, they were now able to rewrite the character of B.J. Blazkowicz. Öjerfors asserted that this was a priority for The New Order, and that the writing team had made great strides in improving B.J.—a boast that my hands-on time with the game’s wit-filled dialogue will defend. Turning away from the Adonis action-hero mentality that defined the protagonist in earlier games, MachineGames wanted to create a much more human main character. B.J. wakes from a coma (the cause of which will be learned as the game progresses) to a world in which he has utterly lost. Öjerfors described B.J.’s position aptly, saying that he really doesn’t know why the world is in such a state. Last he saw of it, the Nazi regime was in recession, yet now the entire world is split between two grim options: with or against the Nazis. This disparity sets up the game’s narrative aspects, but, again, stays true to the Wolfenstein flavor: Nazis doing crazy Nazi things while the underdog attempts to stop them. Having gleaned a bit of the game’s base values, I went on to question about how the gameplay side of things would reflect The New Order’s various innovations. This is complemented by the key factor in the project’s level design, Öjerfors noted. Rather than giving the player a designated solution and position to, say, a room full of variously positioned enemies, The New Order will offer as many options as possible. Öjerfors explained that he wants every strategy to appear doable and for the player to learn which is the most effective on their own. After recovering from my flabbergasted state (An FPS game demanding strategy and learning from the player? Who would’ve thought? ), I asked for an example of how diversity would play out in fights. Öjerfors responded with an overview of the scenario I had just played through myself: An indoor hangar housing three stationed but armed attack helicopters, two Nazi sentry robots, and over a dozen Nazi foot soldiers. To my surprise, however, he revealed several in-game options that I had never even thought of. Walking me through the level’s multifaceted approach, Öjerfors first established that the player begins in a corner with only one soldier nearby. From here, the most obvious choices are to kill the lone soldier with stealth, enter the nearby room to scrounge for supplies before initiating combat, or leaping over the railing to take cover behind a stack of metal crates. Of course, you could also begin shooting as soon as you spot an enemy, relying on your FPS prowess to win you the day. Öjerfors went on to describe the wealth of options that follow afterward: heading to an inactive chopper and making use of its side-mounted turret; heading across the room’s lower route to an obvious supply cache to bulk up before conflict; continue to stealth kill as many enemies as possible to thin out the ranks; lure the slow-moving sentry robots away to allow time to deal with foot soldiers—the options are quite clearly endless, and the player has everything at their disposal, provided they can think of it. The process of “learn and adapt” is aided by the game’s checkpoint system. In the above scenario, the most recent save point is just before the player drops behind the first soldier. This gives the player plenty of elbow room to retry without worry, and it keeps the penalty of death from becoming overbearing. After speaking with Öjerfors, as well as playing The New Order myself, I was able to walk away from the interview with a solid opinion on the next Wolfenstein. Sure, the answers to my previous questions inevitably raised further questions, but it’s now clear that MachineGames is the ideal developer to be heading up the project. 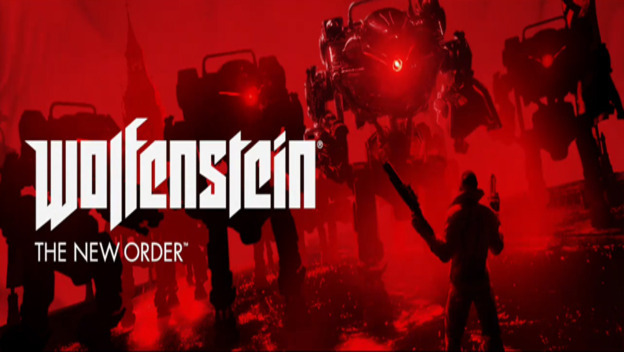 Accounting for Wolfenstein history, eliminating its hindrances, and offering the player every option in the FPS book—Öjerfors’ statements have concreted the fact that Wolfenstein: The New Order will be a fresh experience. Far from a shallow grab at profiting off a big name, MachineGames has shown that they expect their next big project to wow fans of both retro and modern shooters. And, quite frankly, I’d bet money that it will. For a full breakdown of how the game plays, check out our hands-on preview.